Easier to ignore when it looked but OK on freevee, Keeper Of The Flame leaps to life thanks to current-streaming HD, a visual knockout and close as Tracy-Hepburn got to doing a horror movie, or at the least, gutsy noir. Keeper Of The Flame is further argument for library titles as reborn thanks to High-Def, giving us chance at long last to see them in something like visual integrity they had when new. Now that more and more are emerging like this, it's maybe time to fresh appraise the lot. 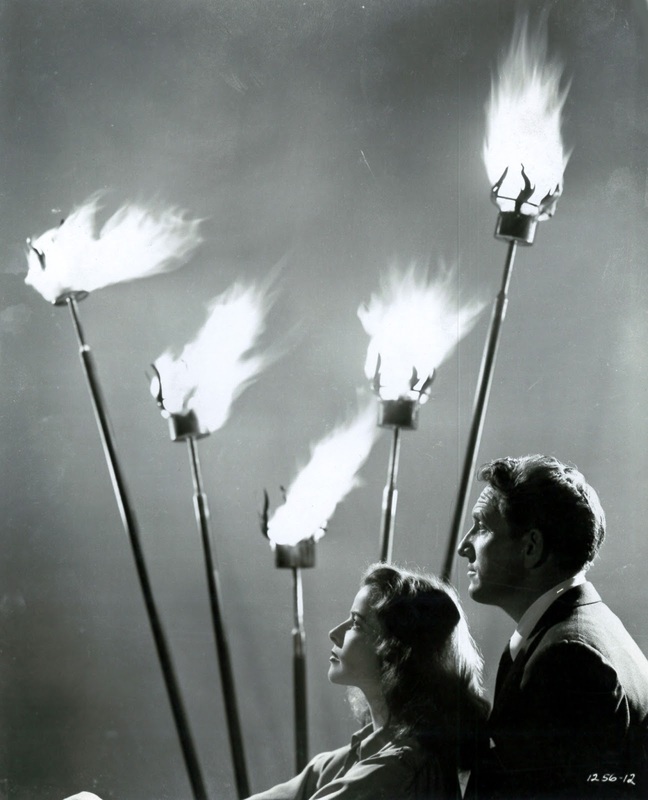 I put Keeper Of The Flame among chief beneficiaries of the upgrade; what grabs to start is a whole thing shot indoors, sound stage forest not so petrified since Universal dressed Son Of Frankenstein with dead trees, and boy, does HD show how moodily Flame was designed and lit. When Tracy walks this simulated earth, you expect monsters to hop out. 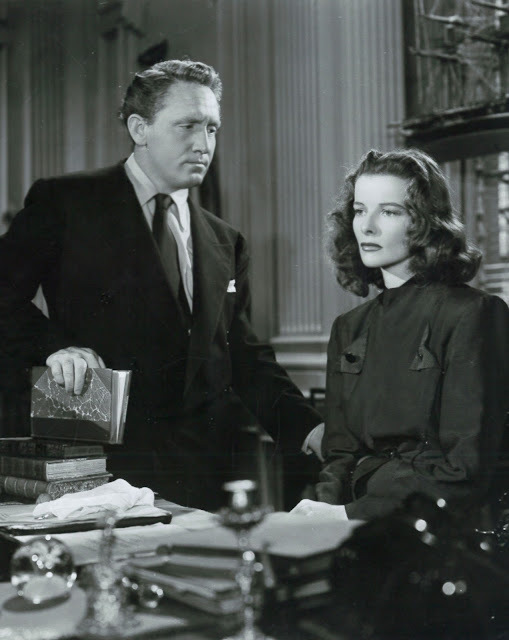 The pic burns would-be intense, but Metro's adapt of a heavy-theme novel was hobbled by censors and a message muddled by, among others, K. Hepburn interfering more than usual along creative line. The big reveal for a third act is plain from opening, a Great Man lately gone being exposed as Fascist and on verge of US takeover. Tracy and newshounds, of which he's supposed to be most perceptive, should see it coming from youth stood like Bund ralliers in a first scene. 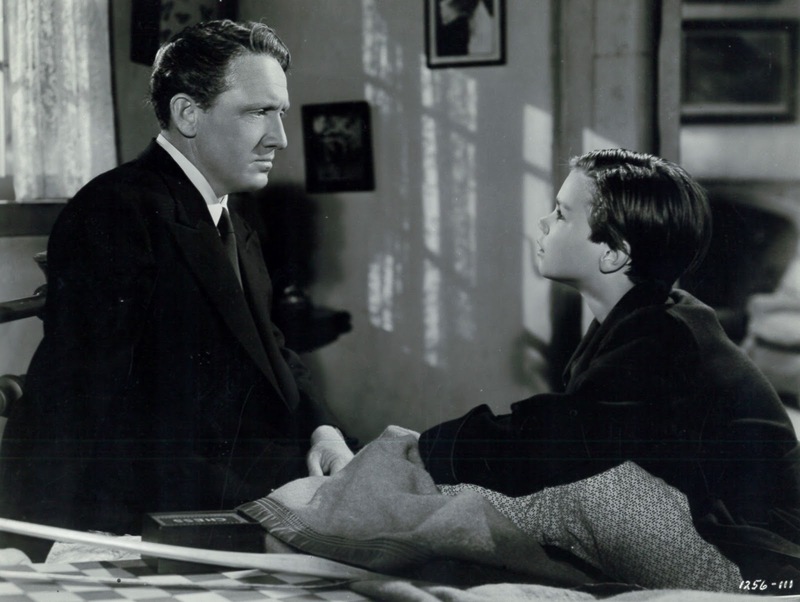 ST plays loftier spin on hotshot scribes he did lighter at Fox Film Corp or even MGM in contract beginner days (see The Murder Man); here he speechifies to little Daryl Hickman about enslavement threatening us all. Wartime urgency, of course, made all this more palatable then than now. 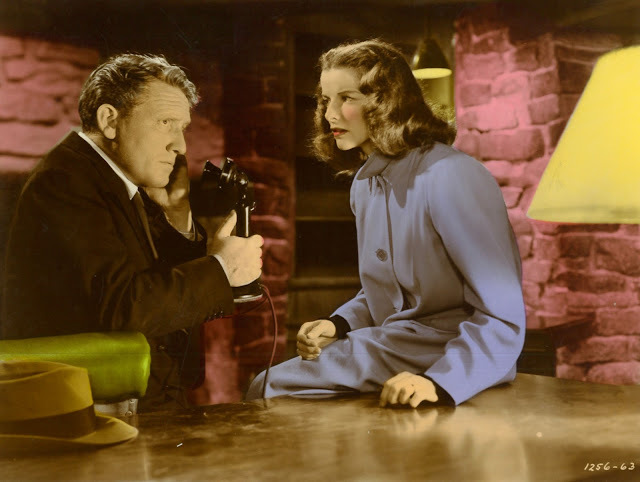 Like much of Metro on "A" setting, Flame burns twenty minutes longer than needed; let's say it's a bit scorched at the end, what with Spence/Kate trapped in a cabin fire set by a male Mrs. Danvers (Richard Whorf) ... it was '42-suggested that Keeper's third act had gone off rails. That cabin, by the by, is convenient repository for evidence needed to defame the departed Robert Forrest, him unseen thanks to plunge off a bridge in opener scene. Radio transmitters and world maps in plain sight indicate nationwide siege, and Hepburn's confession confirms an organized Fascist network waiting in wings --- so what happens to all them now that homegrown Mabuse is gone? I saw the face of fascism in my own home, she says, hatred, arrogance, cruelty. 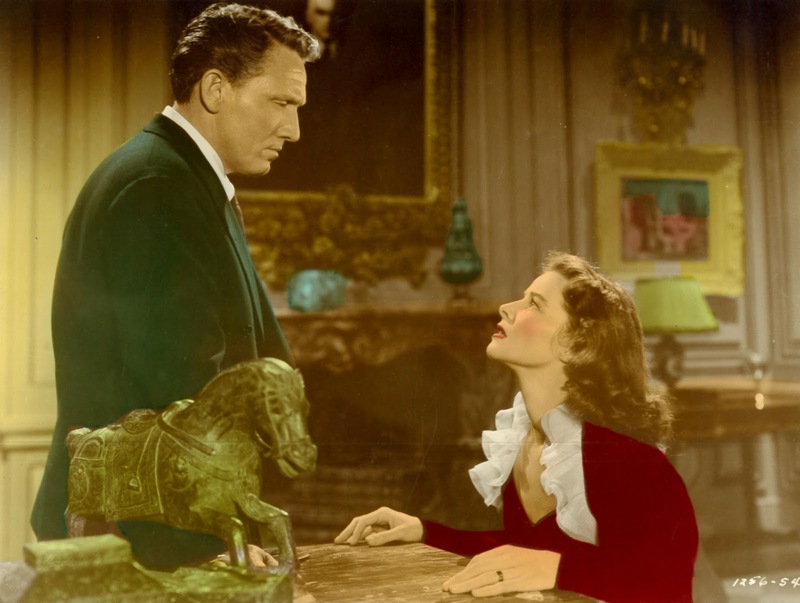 That's a sort of dialogue you cope with for watching, but never it mind, Keeper Of The Flame is a looker and well off expected path of Tracy-Hepburn; they never even get together romantically, a good thing as it's all that indoor-for-outdoor artifice and gothic milieu we're here to enjoy. In stunning HD, it's gracious plenty, especially now that TCM is serving that way in addition to high-def glimpse streamers supply. Richard Whorf, who morphed from actor to director of features and TV's No. 1 series THE BEVERLY HILLBILLIES. Just caught this on Warner Instant. Had attempted it years ago, lost interest and never finished. This time, my wife and I found it a grabber... for many good reasons and a few unintentional ones. Love these wartime A pictures that totally embrace the necessity of studio exteriors and glass shots, creating that great 'Old Hollywood' alternate universe. Beefing up Audrey Christie's part would have suited me; great contrast with the very theatrical Hepburn, Christie comes off as natural, even contemporary, even though this stage actress was making few features at the time. I was already impressed with its visual quality when I saw it for the first time in the Latin American version of TNT (before TCM was created) almost 30 years ago. The story was too obvious and I guessed how it was going to end a few minutes later from the beginning. The still photographer must have said to Tracy, "OK, Spence, gimme the same expression each time!"